I had a few minutes before a meeting in Waco, so I searched on-line to see what congregations may be in close proximity. 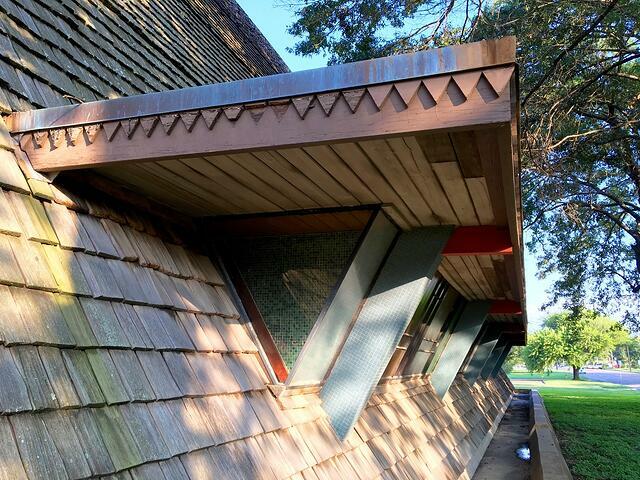 The name Rodef Shalom drew my attention and when I saw a thumbnail of the dramatic A-frame structure, I knew I had to check it out. Rodef Sholom proudly promotes itself as McLennan County’s oldest and largest Jewish congregation. This Reformed Jewish community has some great programs and resources on line, including some good information about its history. In its early days, the newly formed congregation purchased a site on Washington Ave. In 1910, they replaced their first Temple with a classical design constructed by celebrated local architect Milton W. Scott. 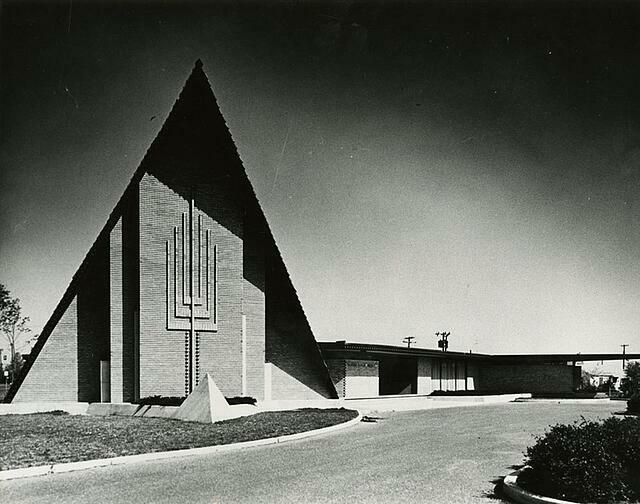 In the late 1950’s, as the congregation began plans for a move they commissioned the prominent Houston firm McKee and Kamrath. With the help of associate architects Bush and Witt, the distinctive Temple building was dedicated in 1961. This image shows there are no modifications to the original design. Waco History website. I was very impressed with the careful detailing of this design. 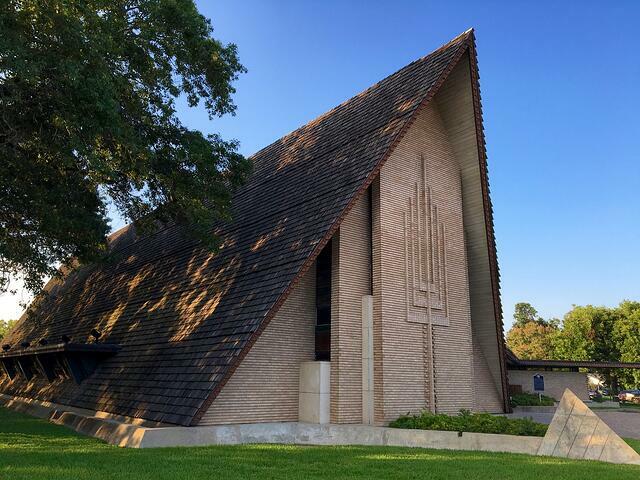 The Temple Rodef Shalom’s website has a great description of the design and its importance to the congregation. 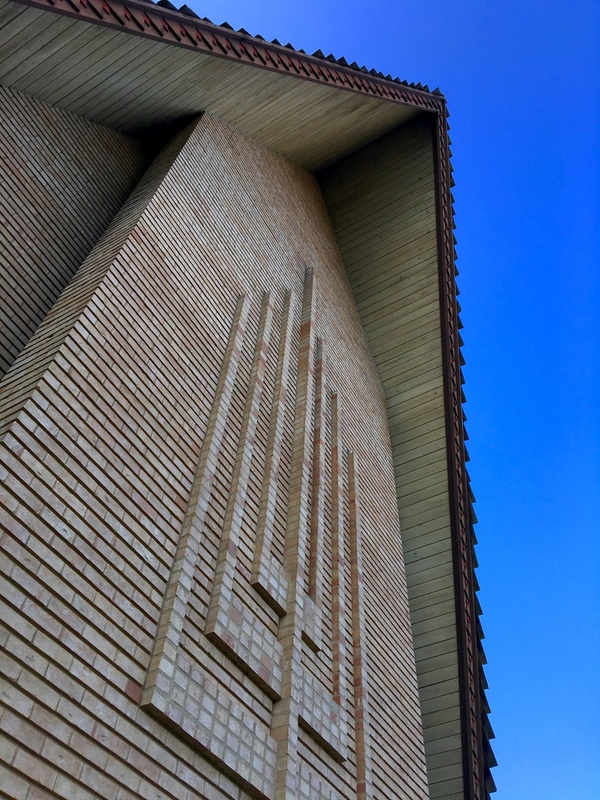 “Located near the intersection of Forty-First Street and Colcord Avenue, the current Temple Rodef Sholom is one of Waco’s most striking places of worship. Not unlike a towering tent, the sanctuary recalls the Biblical ohel moed (tent of meeting) in which Israel worshipped during the wilderness sojourn. The roof is sloped in such a manner that it reminds congregants of the kanfe ha-schechina (sheltering wings of God’s presence), a reoccurring theme in Jewish sacred lore. 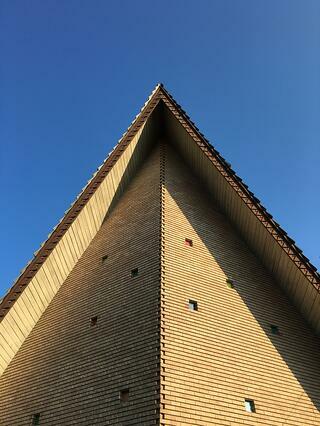 Even the temple’s roof shingles carry added meaning as they were fashioned to resemble the traditional shingle form used by Eastern European synagogues destroyed during the Holocaust. The southeast wall features a menorah (branched lampstand) as a soaring bas relief. 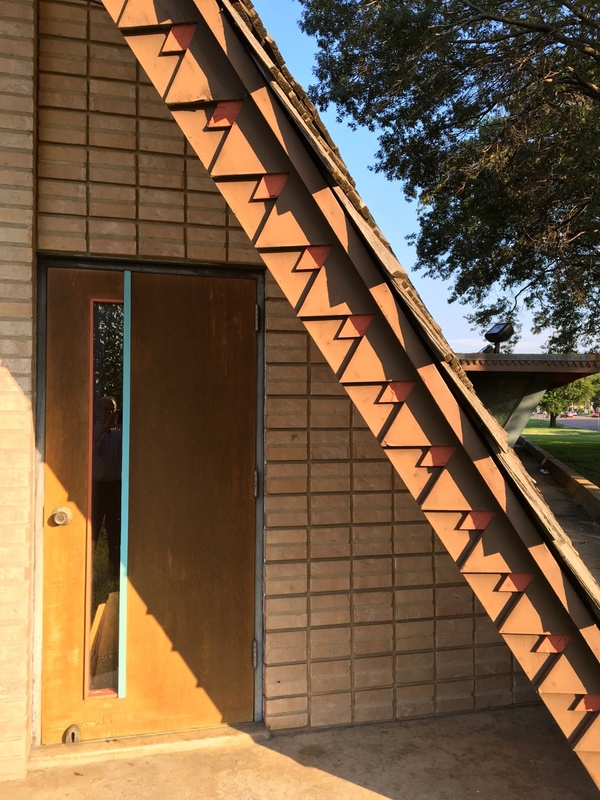 Affixed to the main doors are twelve copper plates bearing the names and emblems of the twelve tribes of Israel. The sanctuary is designed around the aron hakodesh (holy ark), a closed recess in which the Torah scrolls rest. Regarded as the holiest space of the synagogue, Rodef Sholom’s aron is elaborately ornamented. The doors of the aron feature six pairs of panels. Each pair of panels depicts holy images or symbols central to the Torah. At the height of the aron is the ner tamid (eternal light). Continuously lit, it symbolizes God’s living presence and the permanence of moral law. Just below the ner tamid stands a reproduction of the two tablets of the Ten Commandments given to Moses at Mount Sinai. Update: I revisited Temple Rodef Sholom the day before Yom Kippur. Here's more about a wonderufl tour of the exquisite interior.